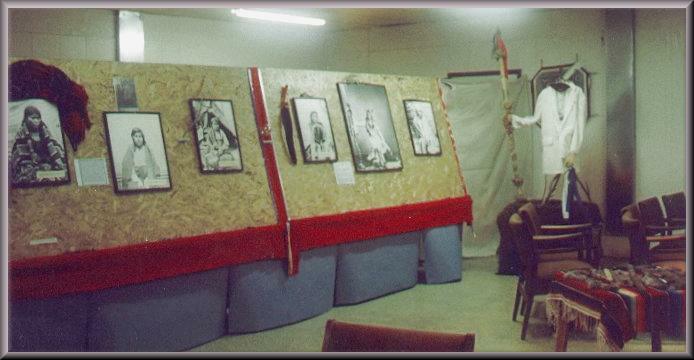 One of the Exhibits we have held at the Museum was the 'Sacred Circle of Life' featuring photographs of Dakota and Ojibwa people of Minnesota, from the 1860's to the 1970's. 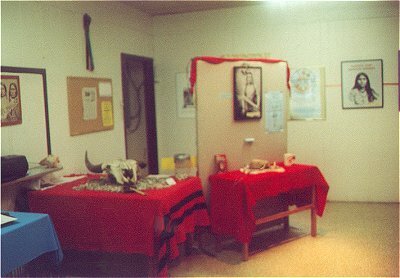 This exhibit ran through the summer of 1997, and was shared between us and the Pipestone County Museum also in Pipestone. The photos below show a part of the Exhibit. The above picture shows the people who were involved in the 1862 Minnesota Conflict. 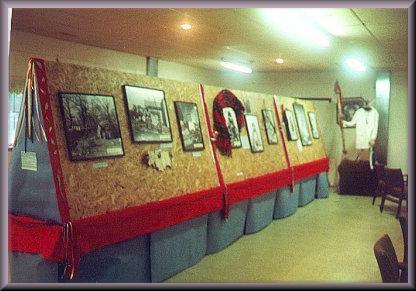 The people who came to view the photographs were really touched and many left tobacco offerings below the photos. Often people would be standing looking at the display with tears in their eyes, especially when looking at the photograph of the lady with the blanket around her shoulders, her face told a story on it's own. Since this exhibit was shown Chuck and Gloria have been a part of two Committees working on the 1862 history, the first the Gathering of Kinship was to allow the spiritual healing to take place of the people who were involved in the 1862 upheaval in Minnesota, many ceremonies took place during a 4 year period to allow the healing to take place. The second is happening now, it is a Dakota march that takes place every two years to commemorate the forced march of the Dakota people in 1862. People from each Dakota band are joining to walk the miles that their ancestors took that cold winter many years ago. We would have loved to have this group of pictures on permanent display, as it is a part of our history, as Dakota people. However the whole exhibit was given to an Ojibwa museum to display.